The United States Women’s National Team’s quest for World Cup revenge is underway in Canada, with a 3-1 win over Australia coming on Monday in the squad’s Group D opener. Also, while some of the women are well known around the country, players like Abby Wambach, Hope Solo and Alex Morgan, there are a handful of fresh faces on the team. Here are ten players who are World Cup first timers. Leroux represented Canada in youth levels, but made the transition to the United States women’s national under-20 team in 2008. She joined the U.S. senior national team in 2012 where she was a part of the Americans’ winning squad at the 2012 Olympic Games in London. She currently plays for the Western New York Flash in the National Women’s Soccer League and has 33 career international goals. See Sydney’s full bio, here. Engen joined the U.S. Women’s National Soccer Team for the 2011 Algarve Cup and has made 26 appearances since. She was a part of the United States U-23 team in 2009 as well as the United States U-20 team in 2006-07. She currently plays for the Western New York Flash and is a graduate from the University of North Carolina. She has three career international goals. See Whitney’s full bio, here. Holiday is a two-time Olympic gold medalist for the United States, appearing in the 2008 Beijing games and the 2012 London games. She has competed for U.S. International teams since 2004, when she started with the United States U-17 team. She went on to play for the United States U-21 team in 2005 and United States U-20 team in 2006-07. She currently plays for FC Kansas City in the National Women’s Soccer League and has 23 career international goals. See Lauren’s full bio, here. Brian is the youngest player on the United States Woman’s National Team at 22 years old. She got her start with the United States U-17 team from 2008-10 before going on to play for the United States U-20 team in 2012. She has been with the United States national team since 2013. Brian currently plays for the Houston Dash in the National Women’s Soccer League and has four career international goals. See Morgan’s full bio, here. Chalupny is the oldest first-timer of the group at 31 years old. She won a gold medal with the U.S. Olympic team at the 2008 Beijing Olympics as well as a bronze medal at the 2007 FIFA Women’s World Cup. She currently plays for the Western New York Flash in the National Women’s Soccer League and has 10 career international goals. See Lori’s full bio, here. A University of North Carolina graduate, Harris has been in the national soccer ranks since 2000, when she first started off with the United States U-19 team until 2004. 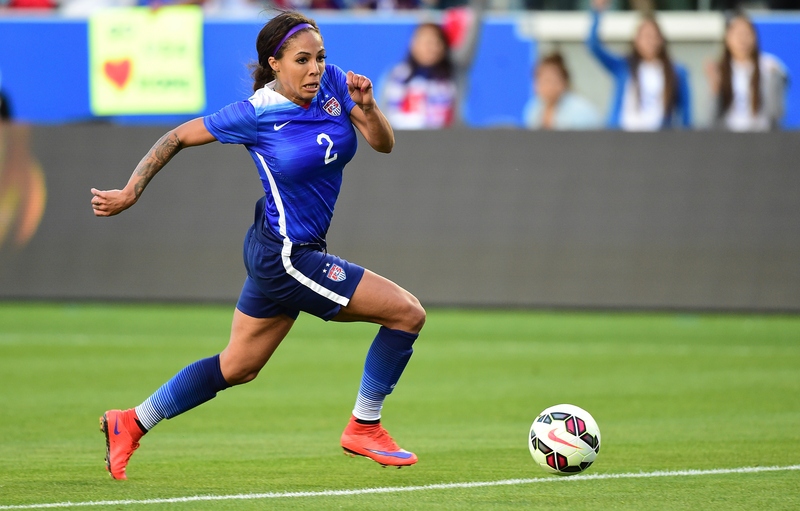 She played for the United States U-21 from 2005-2006 and has been with the national team since 2013. She made her appearance for the senior team on March 11, 2013 against Sweden. She previously played for FCR 2001 Duisburg in Germany and currently plays for the Washington Spirit in the National Women’s Soccer League. See Ashlyn’s full bio, here. Johnston began her run to the senior team with the United States U-15 team in 2007. She then played for the United States U-18 team before playing for the United States U-20 team in 2012, where she appeared in the 2012 FIFA U-20 Women’s World Cup, captaining the United States to the championship along the way. She has made 13 appearances for the senior team since 2013 and has tallied three career international goals, all of which have come off of assists from teammate Lauren Holiday. She currently plays for the Chicago Red Stars in the National Women’s Soccer League. See Julie’s full bio, here. Naeher has played for both the United States U-16 and U-17 teams. She played for the United States U-20 team in 2007-08 as well as the United States U-23 team in 2009. She has been with the senior team since 2014. At her alma mater Penn State, Naeher started every game during her career. She currently plays for the Boston Breakers in the National Women’s Soccer League. See Alyssa’s full bio, here. Klingenberg appeared for the United States U-16 team in 2004, the United States U-17 team in 2005, the United States U-19 team in 2008 and the United States U-23 team in 2009-10. She has been with the senior team since 2011 and was an alternate for the 2012 London Olympic team. She previously played for the Swedish team Tyreso FF in 2012-13 and currently plays for the Houston Dash in the National Women’s Soccer League. She has two career international goals. See Meghan’s full bio, here. Press appeared for the United States U-20 team in 2008 before playing for the United States U-23 team in 2009-10. Like her teammate Meghan Klingenberg, Press attended the 2012 London Olympics as an alternate. Press got her first real international action in 2013 during the Algarve Cup, where she tallied three goals. She has previously played for Swedish teams Kopparbergs/Goteborg FC and Tyreso FF from 2012-14 and currently plays for the Chicago Red Stars in the National Women’s Soccer League. She has 21 career international goals. See Christen’s full bio, here. The women will return to action Friday, June 12 to take on Sweden at 8 p.m. USA will conclude group play on Tuesday, June 16 against Nigeria at 8 p.m.
David Heim can be reached at david.heim@cbs.com or on Twitter @davidheim12.